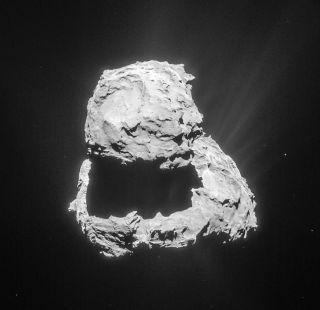 This image, taken by Europe's Rosetta spacecraft, shows Comet 67P/Churyumov–Gerasimenko. The Philae lander (located somewhere on the surface of the comet) has been silent since its landing in November 2014. The first spacecraft to make a soft-landing on a comet is still quiet on the dusty cosmic body, despite being hailed by another probe orbiting the lander. The European Space Agency's Philae spacecraft hasn't responded to pings from the Rosetta orbiter since officials began trying to revive the spacecraft parked in a shady spot on Comet 67P/Churyumov–Gerasimenko this month. Philae made a bumpy landed on the comet in November 2014, but its batteries ran down when it didn't have enough sunlight to recharge. The lander has been quiet ever since. However, the comet is much closer to the sun now than it was six months ago. Mission managers started trying to contact the lander mid-month in the hopes that it had enough energy to respond. But so far, no luck. "It was a very early attempt; we will repeat this process until we receive a response from Philae," Stephan Ulamec , German Space Agency (DLR) project manager, said in a statement. "We have to be patient." The next favorable opportunity for listening in will likely take place in the first half of April, but the timing hasn't yet been finalized, DLR added. Periodic listening attempts are expected to take place at least through the summer. There's still a chance that Philae could respond next time, DLR added. Previously, the space agency sent commands to the hibernating spacecraft to help it conserve power. The spacecraft is designed to wake up when its solar panels can generate 5.5 watts of power and its internal temperature is higher than minus 49 degrees Fahrenheit (minus 45 degrees Celsius) The lander, however, needs to generate about three times as much power (19 watts) before its transmitter can respond to Rosetta. If the spacecraft does awaken, the first priority for controllers will be seeing how healthy it is after half a year hibernating. If the spacecraft can, it will do more observations of the surface to see how Comet 67P/C-G changes while approaching the sun. The Rosetta mission has made numerous discoveries since arriving at the comet in August. Among them: organic molecules on the surface, the first detection of molecular nitrogen in comet gases, and water that is likely of a different isotope composition than what arrived at the early Earth.